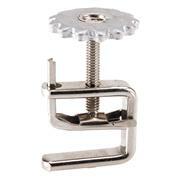 These Rod Clamps are otherwise known as the "muff" portion only and can be used to create custom clamps to satisfy a wide range clamping applications. 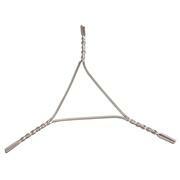 14ga Square, Nickel-Chrome Wire Triangles protect glassware on hotplates and over burner flames. 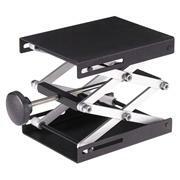 Sturdy Tripods featuring adjustable openings through the use of detachable rings. 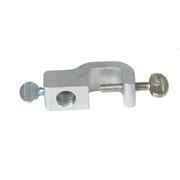 Similar in design to our Screw Compressor Clamps except that the compression adjustment screw has a 1" (25mm) diameter serrated head for greater leverage. 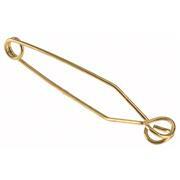 The clamps are constructed from brass and plated for corrosion resistance. 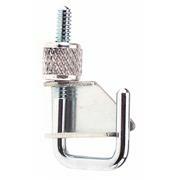 With a full 360° jaw rotation, this fully adjustable clamp is ideal for attaching to rods up to 3/4" (19mm) in diameter. 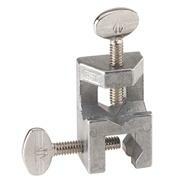 The clamp has an aluminum muff with steel thumbscrew and phosphor bronze jaws. The maximum distance from the jaw to the muff is 4-3/8" (111mm) and the overall length is 5-1/2" (140mm). 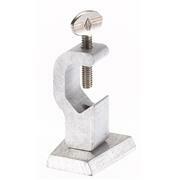 These safe, simple and strong tubing clamps can be used on thin or heavy-wall tubing. 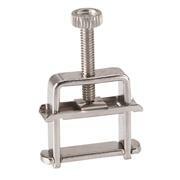 Made of plated steel, the clamps incorporate a large aluminum knurled adjusting nut. 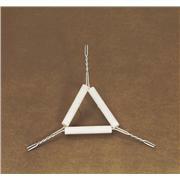 Hook Collars are used for attaching pulleys, balances, cords, trusses, pendulums, and other apparatus to support rods. 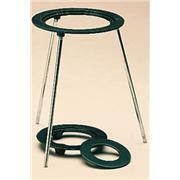 The collars are plated for corrosion resistance and are supplied complete with thumbscrew and hook. 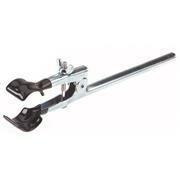 Manufactured from heavy die-cast aluminum, this clamp is designed for clamping two pieces of apparatus into any of the three following positions: right angles, parallel, or vertically. 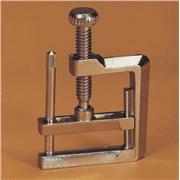 The clamp will accommodate attachments up to 1/2"(13mm) in diameter. 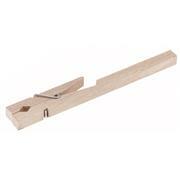 This clamp is constructed from hardwood with a smooth finish and self-closing spring. 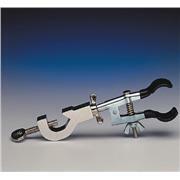 The clamp will accept tubes up to 3/4" (19mm) in diameter. 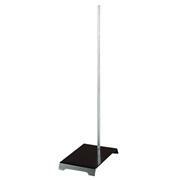 Overall length is 7" (178mm). 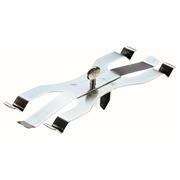 This clamp can be instantly detached from vertical surfaces such as heaters. 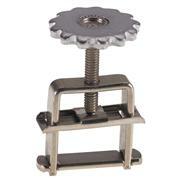 It is constructed of aluminum and incorporates a 5/16"-18 by 1-1/4" steel thumbscrew. 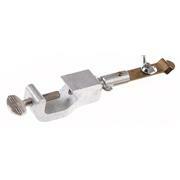 The clamp is 1-3/16" wide by 2-15/16" (30mm x 59mm) long and measures 1-3/8" (35mm) from muff center to the dovetail. 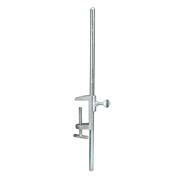 Designed to allow users to mount rod vertically or horizontally. 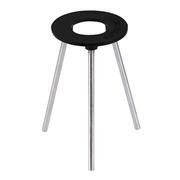 The clamp is cast iron with a black enamel finish. 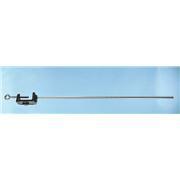 Supplied complete with a 3/8" x 20" (10mm x 508mm) rod (H-21350) or a 1/2" x 24" (13mm x 610mm) rod (H-21360). 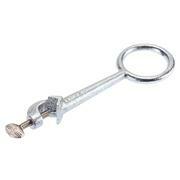 Distance from center of ring to center of clamp: 4-1/4" (108mm). Plated. 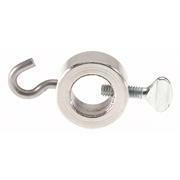 Attaches to support rods up to 3/4" (19mm) in diameter. 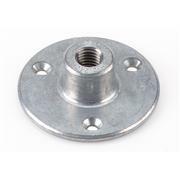 Two prong zinc-plated, stamped steel with aluminum alloy holder is adjustable by checknut to any angle Takes objects from 3/8” to 1 3/8” diameter. 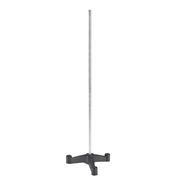 Fits rods up to 1/2” diameter. Length: 6 3/8”. 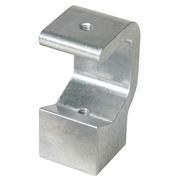 Flat round edge nickel-plated steel wire jaw construction. 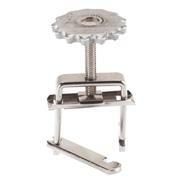 14ga Round, Nickel-Chrome Wire Triangles protect glassware on hotplates and over burner flames.